Will Obama's Plan Bring The Ebola Outbreak Under Control? : Goats and Soda The ambitious scope of the intervention has impressed aid workers, who have been crying for help for months. But the plan will need to be implemented quickly to get ahead of the spread of infections. Will Obama's Plan Bring The Ebola Outbreak Under Control? President Obama meets with Emory University doctors and health care workers during his visit Tuesday to the Centers for Disease Control and Prevention in Atlanta. It is the biggest anti-Ebola effort yet. After months of calls by aid workers for the global community to do something about the escalating crisis, President Obama has announced plans for a massive international intervention. His $175 million proposal is more expensive, far-reaching and ambitious than anything else that's been thrown at this outbreak. Aid groups and health workers battling Ebola welcome the plan — but raise some concerns. Obama made the announcement at the Centers for Disease Control and Prevention in Atlanta on Tuesday afternoon. Stating that the Ebola epidemic in West Africa has become a global-security threat, he said rapid action is needed to bring it under control. Obama will send thousands of American military personnel to the region to build hospitals, train health care workers and deliver relief supplies. 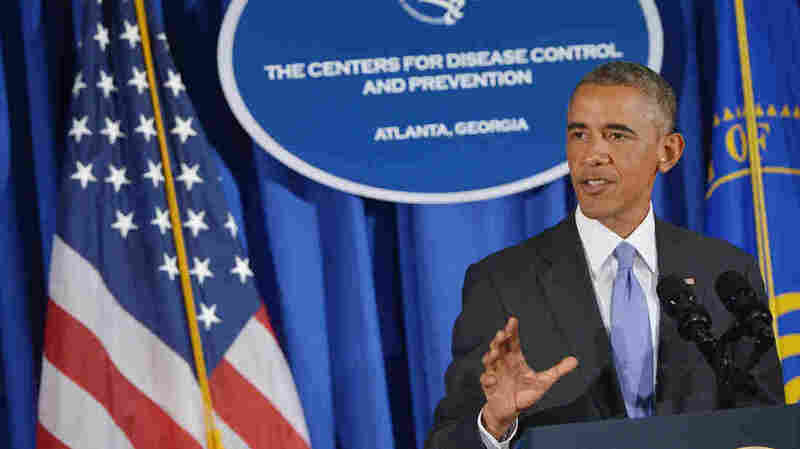 In a Sept. 16 press conference from the Centers for Disease Control in Atlanta President Obama describes the escalated U.S. response to Ebola outbreaks in Africa. "At the request of the Liberian government, we are going to establish a military command center in Liberia to support civilian efforts across the region," he said. The Defense Department is also going to set up a logistics base in Senegal to ferry personnel and relief supplies to the countries hardest hit by the disease. American troops will construct 17 Ebola treatment centers in Liberia. They'll also set up a health-care facility to train thousands of locals to look after people infected with the deadly disease. An administration official, speaking on background, says the tab for the Defense Department's Ebola response efforts could run as high as a billion dollars. In addition, the U.S. Agency for International Development will help distribute hundreds of thousands of personal protective kits to homes in the region, with gloves, masks and disinfectant. Doctors Without Borders has been warning for months that this Ebola outbreak is out of control. Brice de la Vigne, the operations director for the group in Brussels, says the U.S. plan is a step in the right direction. He just hopes it can be put in place quickly. "Time is a key element," says de la Vigne. "Whatever the deployment, it needs to happen very, very quick." The Obama administration says military personnel are already being sent. The goal is to have much of the program up and running within weeks. The tasks that lie ahead are daunting, says Fitzhugh Mullan, a professor of public health policy at George Washington University who has studied health care in Africa. The public health systems in the parts of West Africa where this outbreak is raging were incredibly weak even before Ebola arrived, he notes, and trying to train 500 new health-care workers a week in even the best environment would be a challenge. Mullan calls Obama's plan unconventional and experimental, but says there aren't many other options on the table. "I think it's ambitious, but I don't think you have a choice," he says. "The alternative — to do this by the book — will undoubtedly let the epidemic get way out beyond you." After all, this is an unprecedented outbreak. There simply aren't enough health-care workers on the ground to treat all the people who are sick right now — let alone the tens of thousands who could become infected in the coming months.